Our signature cakes come as they are seen in the photos below. Each cake was custom designed to suit each flavour. These cakes are the perfect dessert to any dinner party, birthday gathering, and more! Signature cakes may be ordered a week in advance but depending on the week we cannot guarantee it. Moist chocolate cake layered with vanilla buttercream and cookie dough. This cake is any cookie dough lover’s dream cake! Our classic chocolate cake is light and airy making it the perfect pair for our strawberry Swiss meringue buttercream filled. Vanilla cake layered with lemon buttercream and a tart homemade lemon curd filling. If you love lemon this cake is for you! A delicious banana cake made from fresh bananas and chocolate chips, filled with a caramel buttercream and homemade caramel sauce. A light and moist chocolate cake filled with peanut butter buttercream, sure to make every peanut butter lover asking for more! 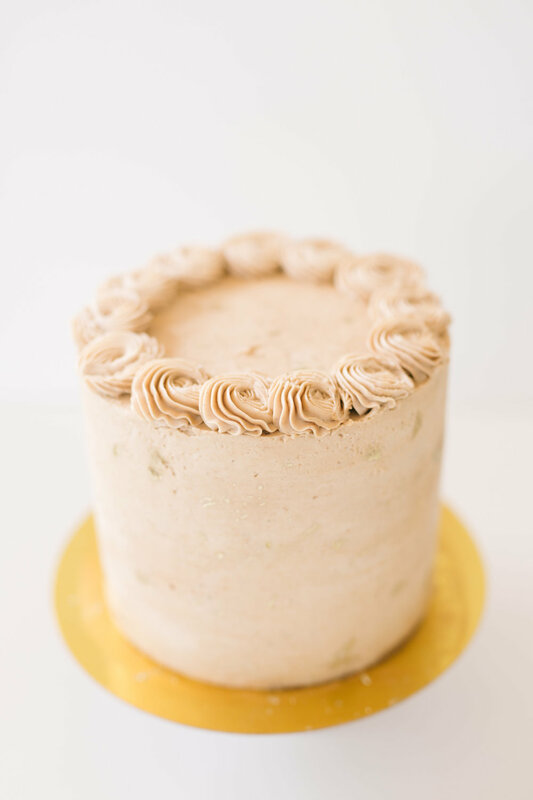 A classic vanilla cake paired with our light and fluffy strawberry vanilla Swiss meringue buttercream. This cake is perfect for anyone looking for something not too sweet.